Please visit the menu on the right hand side to get more information about the different types of hot water systems we work with, supply, service and install. As the name suggests “Hot Water Specialists” that’s right, specialists! 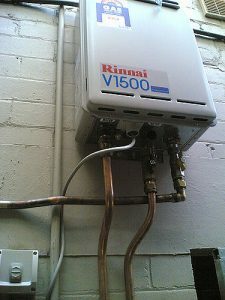 We work on all types and models of water heaters. If it can create hot water, we can help you. Unlike other contractors who want to only replace your water heater with a new system we will work through the issues with you and try to repair or service the system to save you money and get the longest possible life out of the machine as we can. Through regular servicing and maintenance some of our clients have had the same water heater for nearly 30 years! Having well trained members of staff with a broad range of experience gathered through many years in the plumbing industry allows us to lend our hand to domestic applications right through to complex computerised industrial pieces of plant and equipment. The scope where we will travel to help with a hot water issue is limitless, our service vehicles are well equipped, and we can attend in remote areas with confidence. Manufacturers are continually looking towards ways of making there systems more energy efficient, after all no one likes high energy bills. 30 years ago, a water heater could only achieve 2.5 stars for energy efficiency, whereas today majority of manufacturers are achieving a close to 7 stars with some of there appliances. It is with the introduction of computers that these higher star ratings have been achieved. This has also meant that the people who we employ also need to be across more sophisticated devices which now show us faults and history via computers and digital control pads. Businesses such as hotels and aged care facilities cannot afford to be without hot water, they have people depending on them for it and for it not to be delivered could be catastrophic. Creating programmed maintenance schedules and regular inspections of the infrastructure is one way this is avoided. BUT in the unimaginable event of an emergency we are equipped to assist. With easy access to all the types of systems in operation our warehouse is a one stop shop to get a problem fixed fast, it is this type of service our clients have grown to depend on and it is also how our reputation has grown to be strong! A commercial water heater is under more strain then that of a domestic hot water service. The warranty periods are shorter, and components tend to wear out quicker. It is for this reason that we insist on only installing systems from manufactures with a good reputation. Companies such as Rheem/Raypak, Chromagen and Rinnai have been servicing the needs of clients for many years their product is reliable and the parts are easily accessible making them a good option for any business in need of large quantities of hot water for extended periods of time. Fast recovery periods at sustainable energy levels that’s what matters. Certainly, there are many options to choose from when looking for a new hot water service. Finding a company who understands the systems available and why one is better then the other for your circumstances is what counts. We find that through having a 5 or 10-minute phone call with our clients it allows the correct decision to be made, and remember this decision is something you will be stuck with for the next 10 years so getting it right could be the best 10 minutes you’ve spent on the phone. Let’s work together and get a system installed that will deliver endless litres of perfect hot water, it what’s we do best!